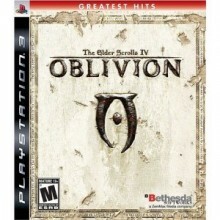 On March 20th, Playstation 3 owners everywhere will have the opportunity to play The Elder Scrolls IV: Oblivion. Although the game originally missed the PS3 launch window, there is no better time for owners to get to experience the title. I had the chance to play test this new version for an hour or so, and it looks to match the Xbox 360 and PC versions as closely as possible. Gamers who have yet to play Oblivion on other consoles should certainly keep their eye on this one, as it could be one of the first great RPG experiences available for the Playstation 3. Bethesda had many different game saves available to try for the Playstation 3 version, but I decided to go straight into the Knights of the Nine quest (which will be fully included straight out of the box). However, some of the smaller plug-ins available for the other consoles will not be available, at least for now. Despite that small detail, the developers have always stated that they wanted owners of each platform (PC, Xbox 360, and Playstation 3) to have the same experience, even if it is slightly enhanced. First off, load times seem a tad bit quicker when compared to the 360 version. Granted, the 360 didn’t exactly load all that slowly, but these minor enhancements make this port feel smooth and seamless. The draw distance also seems slightly enhanced, and allows players to see further into the world than was possible on the title’s previous console edition. Another important element to this port is the control, which feels completely natural on the Playstation 3 controller. Bethesda is not using the tilt functions at all, and to be honest, using tilt controls wouldn’t seem to be a good fit for a game such as Oblivion). But despite this, everything will feel natural when controlling your character. Each and every action translates over perfectly on the new controller, and will allow new players to easily get into the action. Newcomers to Oblivion will find a lot to enjoy with the Playstation 3 port. Those gamers who only have experience with Morrowind will find an extremely different and more action based game that still has a ton of depth to it. Players won’t have access to the upcoming The Shivering Isles expansion pack, but Bethesda is currently investigating the best possible way to get this content to gamers in the future. My hour or so with this port revealed that it will perfectly replicate what other players have already been enjoying on the Xbox 360 and PC for almost a year or so now. And with the extra processing power of the PS3, this should arguably be the best running version of the title yet. If you have yet to experience Oblivion on any other system and have a Playstation 3, definitely give it a look come March 20th. Note: This article was written with additional feedback from writer Moe Rantala, who also had hands on time with the title.